A successful ICO is a testimony to the credibility and scalability of any blockchain startup. On 12th November, Medipedia successfully entered the second phase of its ICO sale. The 1st ICO sale was completed successfully which has further strengthened Medipedia Teams objective of reshaping the traditional medical tourism landscape with a transparent, fast and cost-effective blockchain framework. Medipedia’s blockchain solution comes as a welcome change to the erstwhile medical tourism industry plagued by middlemen (agents) and rising service costs. The Medipedia 2nd ICO Sale is live now with 5% Bonus. In this blog, we highlight the multiple features and usage of the Medipedia (MEP) tokens as well as discuss details of Medipedia 2nd ICO Sale. The 1st Round Medipedia Crowdsale was concluded in the first week of November. The 2nd Round of Medipedia Crowdsale has kicked off today at 00:00 GMT as per the roadmap. Medipedia 2nd ICO Sale will be live for 28 days. Registered Participants and as well as new token buyers can buy MEP tokens. One MEP token is pegged against USD $0.01. The hard cap is USD $10 Million and the soft cap is USD $1 Million. 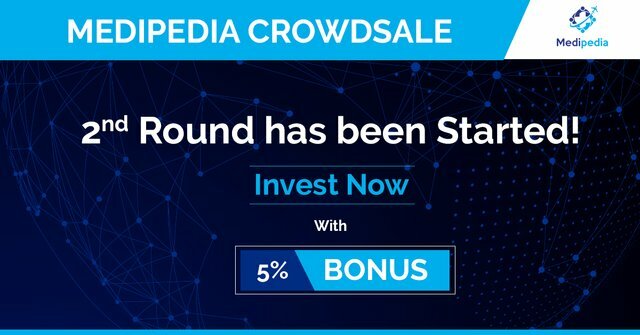 Here are some important facts from the 2nd Round Medipedia Crowdsale. For more on Medipedia 2nd ICO Sale, please visit https://medipedia.io/. “To improve the accessibility and quality of medical services and to achieve decentralization of medical tourism services, which are appropriate to the needs and health conditions of medical consumers”. Like all other things in this infinite universe, healthcare services must also evolve with technology. If we stick too long to the old, there is a very high possibility of missing on the advantages that new things have to offer. The blockchain is one such revolutionary technological tool that can be used to reshape old structures and make them work in the present. Medipedia is one small step in a new journey towards decentralized and cost-effective healthcare services underpinned by the blockchain technology. Medipedia offers a revolutionary makeover of healthcare tourism that benefits patients, doctors and external users alike. P2P Credential Verification ensuring transparent and credible consultation. Health Insurance Portability and Accountability Act (HIPAA) compliance to ensure platform user data security and privacy. Zero Expenditure on Advertisements and Publicity. Profitability Creation with global-scale medical consumers to the Medipedia platform. In addition to this, Medipedia Tourism Platform features blockchain driven Matching and Consultation Services as well as bilateral reviews to offer prompt and credible medical services. As more and more MEP tokens come into circulation, the token will in all probability gain in value and bestow greater purchasing power to token owners i.e to doctors, patients, external users and token enthusiasts alike. To participate in the ongoing Medipedia 2nd ICO Sale, Click here to register. Also for more on MEP Token Structure and fund distribution please refer MEP Whitepaper https://medipedia.io/whitepaper/whitepaper_en.pdf which is now available in five languages.